Create your own cartoons and animations. Developer website: Smith Micro Software, Inc.
Is there a better alternative to Anime Studio Debut? Is Anime Studio Debut really the best app in Illustration category? Will Anime Studio Debut work good on macOS 10.13.4? 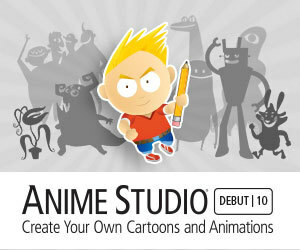 Anime Studio Debut 10 allows users to create their own cartoons and animations. Whether you're a digital enthusiast, a newcomer to animation, or if you want to create art for work or fun, Anime Studio provides what you need to create your own animations faster than anything else available! Enhanced Drawing Tools offer more ways to create and achieve awesome results. Multiple Document Support now allows you to open more than one document at a time, and switch from one to another in a tabbed interface. New Transform Bone tool combines the scale, rotate and translate bone tool functions into one convenient tool. Anime Studio Debut needs a rating. Be the first to rate this app and get the discussion started! Anime Studio Debut, the fun, quick and affordable 2D animation software solution, includes everything aspiring artists and hobbyists need to create and share quality cartoons, movies, anime and cut out animations from start to finish. Anime Studio simplifies the animation process, empowering artists to design their projects faster and easier than ever before. Get started quickly - Anime Studio Debut is packed with ready-to-use cartoon characters, props, video, and sounds so you can start creating your own animations right away. Tutorials and sample files show you how to maximize Anime Studio's powerful features giving you the jump needed from your first project onwards. Your digital art, your way - To get started, sketch your original art, scan in or import graphics, or if you use a pen tablet you can recreate the sensation of drawing on paper. Vector graphics provide power and flexibility - Use multiple layers and resize your images with no loss in quality. Animate your characters using bones - Using Anime Studio's bone rigging system; you can add a skeleton to any image by point-and-click to bring it to life. With Anime Studio, there's no need to create new art for each individual frame as you animate. Just adjust the bones to your desired position and the program will generate the movement for you. It's that easy! Direct your action with an intuitive timeline - Setting your movements to a timeline makes animation easy to understand. Anime Studio will create animations up to two minutes long. Add an audio soundtrack to your animation - Add emotion and style to your animations by adding sound. Anime Studio supports WAV and AIFF formats. Publish for multiple media - Output your finished creations directly to YouTube or save as popular video, TV, and Web formats, including SWF Flash animation files, as well as AVI and MOV movie files. Free Characters - Anime Studio includes Jace, Thorn, and many other exclusive, royalty-free, vector based characters you can use for your own animations. Free Tutorials - Tutorials and sample files show you how to maximize Anime Studio's powerful features and get you animating right away. Import Your Art - Import your own illustrations or create unique characters for your cartoons. Animate anything within the reach of your imagination. Bring Photos to Life - Give life to your favorite photos. Import digital camera images, attach bones and easily turn your photographs into animated movies. New Transform Point Tool allows you to move, resize and rotate any point you wish. More focus is dedicated to your drawings with live Freehand previews. Edit multiple layers simultaneously, including layers of different types, by selecting and apply changes to at the same time.